Tom Lowery, long-time Peoria Youth Sports figure, has been named co-winner of the 1991 Neve Harms Meritorious Service to Sports Award. He has a Masters Degree from Sangamon State University and works as a Management Analyst. A life-long Peorian, Tom is a graduate of Manual where he lettered in three sports. He developed his baseball skills under the late Ed Stonebock, beginning as an eight-year-old little leaguer and lasting through a State Tournament Championship his senior year. Lowery has served as Director of the Averyville and Woodruff Youth Baseball programs since 1971. His involvement as founder of the program grew out of his desire to involve Northside youth in sports rather than the streets. His teams have won over 50 League and Tournament titles, including Peoria City Little League and Pony League Championships. He was the driving force in youth programs in the Averyville area for many years, offering year-round activities for the neighborhood youth in baseball, basketball, bowling and table tennis. He also coached grade school basketball at Christ Lutheran School and led his team to the title game of the prestigious Lutheran Tournament. 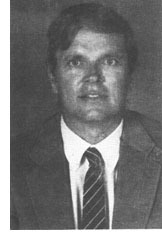 Lowery-coached men's basketball teams won 8 Peoria league titles, 15 tournament titles and in 1976 finished in the top 8 at the National men's Lutheran tourney. Lowery has been a long-time participant in the Illinois Central College Basketball program with Lorene Ramsey and Carroll Herman, serving in several capacities including Radio and TV announcer, PA announcer, Statistician, Sports Information Director, photographer, and promotional services ó all as a volunteer. He is currently on the Board of Directors of the Old Timers Baseball Association. As Youth Baseball Director, Tom is now involved in the drive to develop the Riverfront Youth Athletic Field at Woodruff Park. This ambitious endeavor will provide a centralized lighted baseball facility for Peoria's youth for the first time - a veritable "Field of Dreams" for Director Tom, who has had over 3500 boys and girls participate in his programs. You name the sport and former Notre Dame High School standout Stephanie White excels at it. 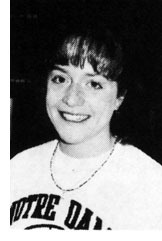 For three seasons she was selected to the Mid-State 6 all-conference teams in volleyball, basketball and softball and to the Journal Star's All-Metro team in basketball and softball also for 1992, 1993, and 1994. In basketball last season she led Notre Dame to its first appearance in the Class AA girls state finals while averaging 15.6 points, 4.1 rebounds and 4.6 assists. She was the Journal Star's Class AA basketball player of the year and was named to the Illinois Basketball Coaches Association and Champaign News Gazette first all-state teams and the Chicago Tribune second team. She set a Notre Dame career scoring record with 1,524 points. In softball she was third in hitting in the Mid-State 6 at .458 with a .615 on-base percentage. A brilliant fielding shortstop, she earned honorable mention honors and was named an all-American by Fastpitch World Magazine. At Notre Dame she won the Mike McGlaughlin Memorial Award for being the school's outstanding senior athlete.